Moving long distance? Woodland Hills Movers would be happy to help! When moving long distance, our movers are required to complete an inventory of household goods form. This will ensure that your personal items will arrive at the new location in the same condition that they left the original location. Inventory of household goods are typically only used for long distance moves unless otherwise requested by the customer. Movers will then tag the boxes with colored and numbered stickers consistent with the item numbers on the inventory of household goods form. After the items are delivered, the customer will then inspect the items and determine if the items are in the same condition that was previously noted on the inventory form. 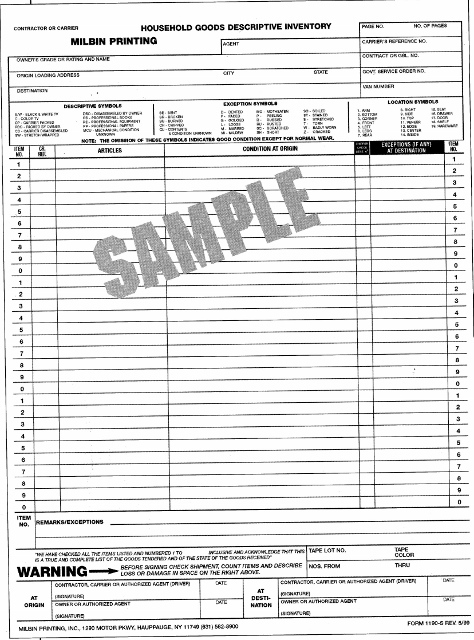 Customers are required to sign the form, agreeing with the movers original inspection of the condition and the inspection post-delivery. Customer participation is encouraged during this process to help prevent any future claims against the moving company. This process is in place to assure a safe and reliable long distance move of your personal belongings. Woodland Hills Movers will provide an excellent experience with your long distance move.